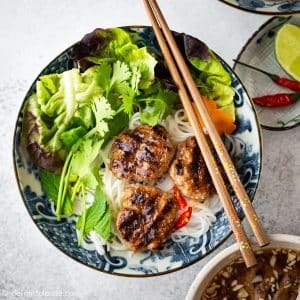 Vietnamese Grilled Pork Meatballs with Vermicelli Noodles (Bun Cha) is a classic Northern Vietnamese dish. Bun Cha features flavorful and juicy pork meatballs, vermicelli noodles, plenty of refreshing herbs and traditional lime fish sauce dipping. It is the dish all Hanoians as well as many Northerners hold dear in their hearts. Bun Cha is thought to originate in Hanoi, but it is also a popular dish in other Northern cities. This dish can be found at every corner of Hanoi, from big streets to small alleys. People in Hanoi eat these grilled pork meatballs with vermicelli noodles for either lunch or dinner. Restaurants or street food stalls selling bun cha usually look modest with basic plastic tables and chairs. Of course, you can find this dish on the menu of fancier restaurants, but those aren’t the places the locals go to eat bun cha. Even Chef Anthony Bourdain chose a street food shop to treat the former President Obama to bun cha in his Parts Unknown series. This classic dish is very easy to make at home. When freshly made, the meatballs smell incredible. Each family has their own way of making bun cha. The recipe below is an authentic one. It is how I like to make bun cha and also how other people I know make it. The meatballs are called “cha“. To make them, you will need ground pork, lots of aromatics, fish sauce, oyster sauce, and sugar. 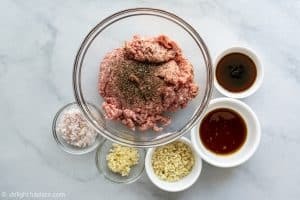 Don’t use ground pork that is too lean since it will make the meatballs turn out dry. I think ground pork with 15%-20% of fat is good, or use ground pork made from pork shoulder. 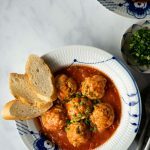 Now, if you want to make these meatballs as authentic as possible, you will need to make caramel sauce from sugar and add it to the marinade. The caramel sauce gives them the distinct smoky sweet taste and caramelized color. You surely can add sugar to the pork directly or substitute with honey, but it won’t taste the same. Bun Cha Hanoi is often on the sweet side a little bit, so cook a teaspoon of the marinated pork, taste and adjust seasoning to your liking. Other ingredients you will need are rice vermicelli noodles, soft lettuce such as baby or butter lettuce, fresh herbs, and lime, sugar and fish sauce for the dipping sauce. I cook mine in the Staub grill pan and they are absolutely juicy and delicious. 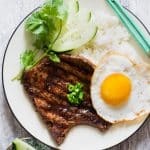 I also used this pan in my Vietnamese grilled pork chops recipe. 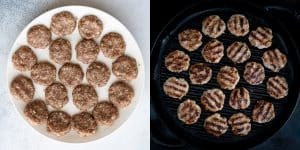 Once the pan is hot, you just need the heat to stay in the middle of medium and medium-high and the meatballs will still get great grill marks and come out juicy. Detailed step-by-step instructions and photos are all in the recipe card below. 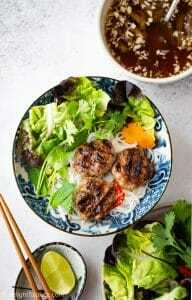 Bun Cha Hanoi is served with grilled pork meatballs, vermicelli noodles, fresh herbs and lettuce and dipping sauce. The dipping sauce usually contains thinly sliced carrots and green papaya to provide more crunch. You can also add bird’s eye chili to the dipping sauce for some heat. The grilled pork meatballs are put directly in the lime fish sauce dipping (nuoc cham) when served. From this point, there are two ways to eat it. The first way to enjoy this dish, also the way most Hanoians eat it, is to use chopsticks to pick up some noodles and dip them into the sauce, then eat with meatballs and herbs. 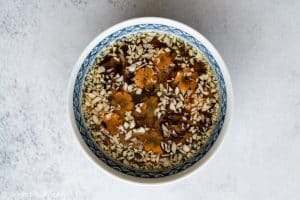 The second way is to add vermicelli noodles, lettuce and herbs to a serving bowl, spoon over the dipping sauce with meatballs into the bowl, and then eat. Regardless of the way you choose to eat it, one bite will bring so many flavors, aromas and textures to your tastebuds. Two other iconic dishes of Hanoi you may like are Vietnamese Turmeric Fish with Dill and Noodles (Cha Ca La Vong) and Hanoi combination chicken noodle soup (Bun Thang). 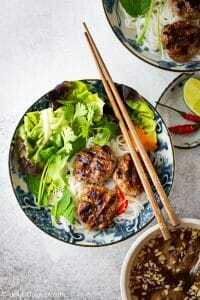 Vietnamese Grilled Pork Meatballs with Vermicelli Noodles (Bun Cha) is a classic Northern Vietnamese dish. Bun Cha features flavorful and juicy pork meatballs, vermicelli noodles, plenty of refreshing herbs and traditional lime fish sauce dipping. In a small saucepan, add 1/4 cup of sugar and 3 tablespoons of water. Bring to a boil. Lower the heat to medium, continue to simmer. You will see a lot of bubbles on the surface. The mixture will then turn from clear to yellow, and get darker as you simmer it. Reduce the heat if needed. Keep watching closely, until it has a slightly dark caramel color, turn off the heat and carefully add 1 1/2 tablespoons of water. Swirl the saucepan to combine and remove it from the stove. Set aside. In a mixing bowl, add the ground pork, caramel sauce and all other ingredients for the pork meatballs. Mix for a couple of minutes to combine thoroughly. 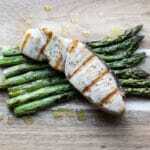 Set aside for 10-15 minutes or marinate in the refrigerator for 1-2 hours for tastier results. To make the dipping sauce, whisk together lime juice, sugar, water, and fish sauce in a bowl. Adjust to taste. Add garlic, and add thinly sliced carrots and green papaya if using. Set aside. Prepare vermicelli noodles according to package instructions. Prepare lettuce and fresh herbs. Heat the grill pan (or preheat gas grill/charcoal grill if that’s what you use to cook the meatballs). Shape the marinated pork into small meatballs. Once the pan is hot, grill them in a single layer until fully cooked. Put the grilled meatballs in the the dipping sauce, serve immediately with noodles, lettuce and herbs. Bun Cha Hanoi is often on the sweet side a little bit, so adjust seasonings to your liking.